To place an order over the phone, please call (704) 900-3618. Courage. Commitment. Service. It takes all three to be a soldier. Honor the soldiers in your life for all that they have sacrificed for our country with our customizable Army 3-Coin Velvet Box. Your gift comes complete with our Products for Good story and certificate of authenticity and includes a liberated Iraqi coin, an Army Service Coin and a commemorative coin of your choosing. Honor friends or loved ones for their service with our beautiful Single-Coin Velvet Box. It comes with a copy of our Products for Good story and certificate of authenticity. Honor the soldiers in your life with our customizable 4-Coin Army Shadowbox. 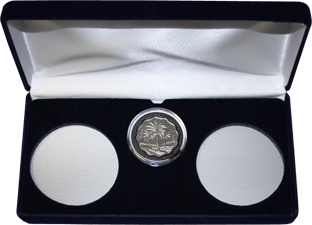 Your gift includes an Army Service Coin, a commemorative coin of your choosing and two liberated Iraqi coins housed in a beautiful 9" x 20" glass-encased wooden frame. You haven't yet added any items to your shopping cart. You can browse our catalog on the right.